Brick Mansions, the last movie Paul Walker starred in, a movie I watched last night thanks to Nuffnang and ChurpChurp. Ironically, the last movie I reviewed on this blog was Fast & Furious 6. I entered the cinema with a surreal feel, with the anticipation of watching Paul Walker act, and realizing I will not be able to see another movie with him in it again. Maybe Fast & Furious 7? In Brick Mansions, Damien Collier (Paul Walker) takes on the role of an undercover cop whose passion in his job to fight against corruption brings him to the notorious Brick Mansions, a whole city blocked, walled and cordoned off from the rest of the world due to it's alleged violent citizens. Damien Collier who wants nothing more than to take down Tremaine (RZA), the ruthless drug lord who killed his father and is based inside Brick Mansions, he forges an unlikely team with Lino (David Belle), an ex con who is surprisingly really gifted in the art of street jumping from building to building. The art is aptly called Parkour from the French for crossing 'parcours', as it originated from street kids jumping across from building to building. The plot moves at a fast and furious pace (forgive the pun), where the camera pans in and out across the city, with car chases, bombs, and rowdy violent gangsters in tow. 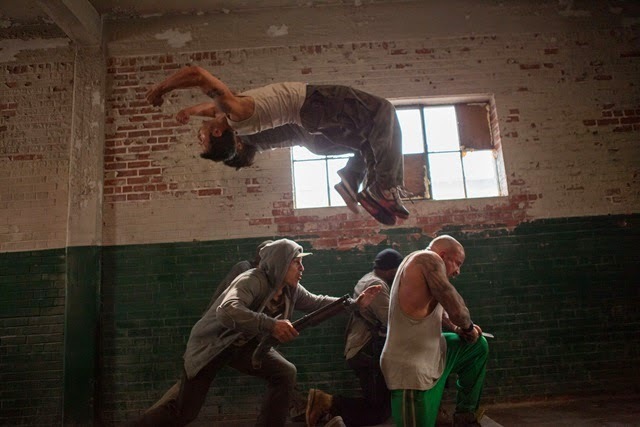 Here we get to see Paul Walker in all his glory fighting, jumping, running all round in his pursuit of Tremaine. There is a small twist in the end, which brings a sense of completeness to the whole movie. Fast cars, lots of running and jumping, gold guns, big and high tech watches, you have the complete ingredients for a wholesome and fun action flick. A Ford Mustang was used in most of the car chase scenes, which reminded me of the movie I caught the other day, Need For Speed. I guess it must be a new trend now. Overall I really like this movie, one which I feel would be the perfect final movie for Paul Walker. With quite a number of intense action sequence, and lots of acrobatic stunts, it does bring out the basic essence which I look forward from action movies nowadays. The movie, Brick Mansions opens nationwide today, so be sure to catch it in a cinema near you! Seems a good action movie and a tribute to the late Paul Walker! I am waiting for Spidey 2! I go for touching, sob movies...not into this kind. somehow the trailer didn't appeal to me. lol. read the synopsis and the plot was lot on me, too. haha. think i'm not going to bother watching it at the cinema. just wait to download. and the only reason i'd watch it is for paul walker i guess.